The Fox & The Hound/The Fox & The Hound 2: 30th Anniversary Edition Blu-Ray Announced!!! 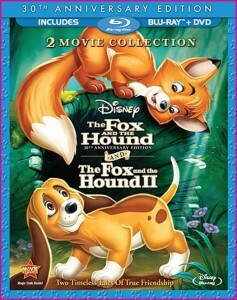 Disney has announced that they will be releasing “The Fox & The Hound” on blu-ray in honor of the 3oth Anniversary. Wow this film came out 30 years ago. 1981. That is the year I was born. I really loved this original film. I am so happy Disney is releasing this in hi-def. Disney has detailed the extras and specs for us to enjoy. There will be a 3-disc version which will consist of a bluray disc that contains both films and two DVD’s with each film on it. Then a set with no bluray for those of you who haven’t upgraded yet. It looks like August 9th will be the date that this will be released. Amazon currently has the set going for $27.99 which is currently 30% off the SRP. Also Amazon is offering a $5 dollar off coupon for pre ordering bringing down the bluray set to $22.99. Not a bad deal. This entry was posted on Monday, May 9th, 2011 at 10:56 pm	and is filed under Film, News. You can follow any responses to this entry through the RSS 2.0 feed. You can skip to the end and leave a response. Pinging is currently not allowed. « Darren Aronofsky and George Clooney Will Team Up To Make An Epic Sci-Fi Film?!?!? !